MKLM Leadership in Cambodia – Welcome to Cambodia, and…..
Ted Miles, the executive director of the Maryknoll Lay Missioners, and Leslie Lopez, our advancement director, went to the Maryknoll gathering in Hua Hin, Thailand with us. Then they came to Cambodia with us when we returned yesterday. They will spend their time here meeting with the Maryknoll Lay Missioners and visiting all of their projects. In the morning today, Leslie and Ted visited the Maryknoll Deaf Development Programme to understand the program and to talk with Russ Brine (R) and Charlie Dittmeier. 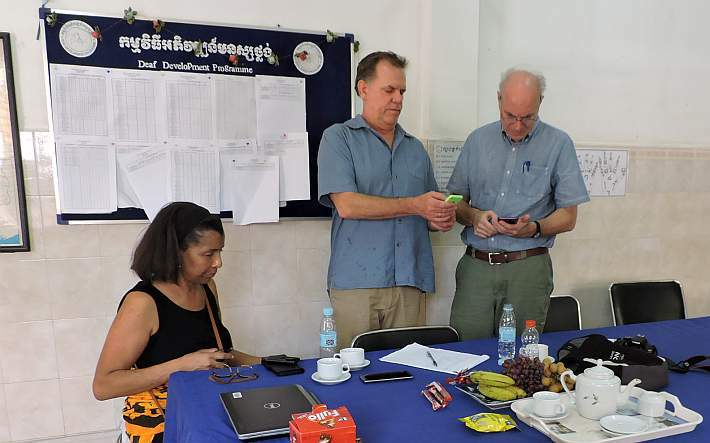 Here they are at DDP, again entering phone numbers for their communications while in Cambodia. In the afternoon, they came to our weekly Cambodia Mission Team meeting to talk about the MKLM’s present situation and direction. Here they are in a general discussion after our meeting, liturgy, and dinner.